GFG Style, the company founded by Giorgetto and Fabrizio Giugiaro in 2016, has its own stand for the second year running at the Salone dell’Auto di Torino “Parco Valentino”, from 6 to 10 June 2018. The GFG Sibylla, a running electric prototype of a 4-seater saloon made in collaboration with Envision Energy, is on display just one week from its Italian preview at the Concorso d’Eleganza at Villa d'Este. The Techrules Ren 3-seater electric sports car with central driving position, designed by Fabrizio Giugiaro and presented in 2017, returns to Turin to delight the public. Turin Garage, a new Turin brand, commissioned GFG Style to act as style consultants for the Torino Parco Valentino Show, and this collaboration has spawned two small 4x4 electric cars that make their world debuts today. "The stylistic and conceptual work we did on the Top Less”, says Fabrizio Giugiaro, CEO of GFG Style, “was to identify and research a fresh, exclusive image for this historic utility car designed by my father 40 years ago. This new, topical open-air electric four wheel drive version thus becomes an exclusive object for the very few". A number of details embellish the Top Less: the door thresholds in treated solid oak, the special two-tone paintwork, the noteworthy interiors in PT Torino denim with inserts in Kult fabric, also by PT Torino. The rear benches can also accommodate up to 6 passengers, and have an original conformation. All the upholstery has been treated in such a way as to make it water-repellent, and is by its very nature intended for "open air" use like a motorcycle, without a top: hence the play on words of the name! "In this case, our intervention”, continues Fabrizio, “was limited to the design and packaging of the seats, which follow the spirit and the lines of the first series Panda, adding to this model textile materials that are very pleasing to the touch". 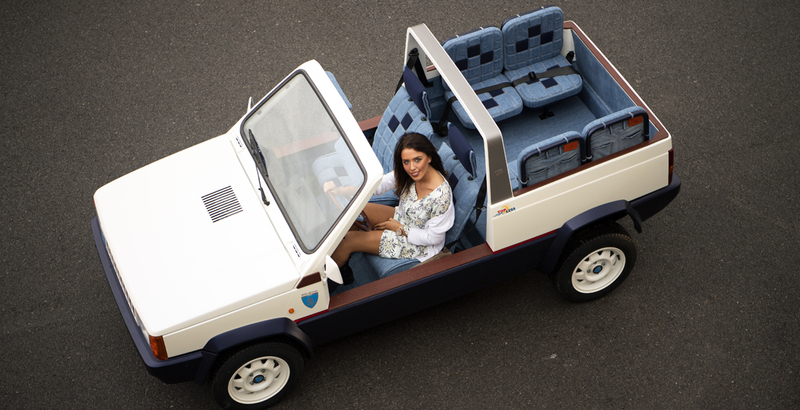 This car also introduces the 4x4 Fiat Panda electric conversion kit by Newtron, the leading Italian and European manufacturer of electric conversion systems. In the prototypes pavilion three models belonging to different periods of Giorgetto and Fabrizio Giugiaro's design story are on display: they start with Giorgetto's first running Show Car of 1963, the Chevrolet Corvair Testudo, before moving on to an original research model for sports cars dated 1965, and finishing up at the present day with the Techrules Ren Rs of 2018, designed by Fabrizio and developed in cooperation with L.M. Gianetti. During the Show Fabrizio Giugiaro will also participate in the Supercar Night Parade on 6 June and in the Valentino Park Grand Prix on Sunday 10 June; he will also be a speaker at the "Tesla Club Italy Revolution" on Saturday 9 June, at the Turin Car Museum. Turin Garage was born out of the initiative of some entrepreneur friends from Turin who have always had a passion for cars and motorcycles of all types and ages. From this passion came the idea of converting, upgrading and personalising iconic cars and motorcycles, so that they are able to move around freely in traffic in compliance with the environment and current regulations. Newtron is the leading Italian and European manufacturer of electric conversion systems pursuant to Ministerial Decree No. 219/2015, the so-called Retrofit Decree. Italy is the first Member State in the European Union to regulate the conversion of Internal combustion to electric vehicles. Newtron has made this its core business and since 2015 has been manufacturing and distributing electrical retrofit systems for cars, light commercial vehicles, buses and boats. The product is 100% Italian, designed and developed entirely in the factory of the former Pirelli area of Villafranca Tirrena in the province of Messina. Today it has a service network of about 50 Newtron Points throughout Italy and a division dedicated to original equipment and the Oem market at the Fiumicino hub. GFG Style has been collaborating since 2016 with PT Pantaloni Torino thanks to the special relationship it has established with the Fassino family. The collaboration began in 2016 with some details for the interiors for the Techrules Ren; in 2017 an innovative line of "Kult" trousers signed Fabrizio Giugiaro and PT Torino was created, and continues today with the use of the interior upholstery of the two Turin Garage cars on display at the Salone. Special thanks go to Cristina Tardito and her fashion house for supplying dresses from the new spring-summer collection 2018 for the models to wear. GFG Progetti s.r.l. © 2017 All rights reserved.